Get 30% discount on Handbags with Code: INTHEBAG. Valid 3/27 - 4/10! Do not miss another Naturalizer voucher! 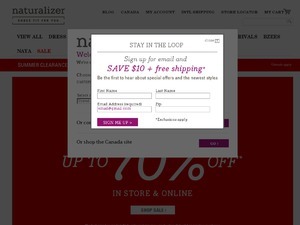 Simply leave your e-mail address and we'll always keep you informed of new vouchers for Naturalizer. Friends & Family Event: 30% discount on Plus Free Shipping with Code: NATFF19. Valid 3/20 -3/26! Get 25% discount on Sale Styles with Code: SALE25NAT. Valid 3/15-3/16! Get 25% discount on Sale Styles with Code: SAVE25NAT. Valid 3/8-3/9! Get 25% discount on Plus Free Shipping with Code: SPRINGFEVER25. Valid 3/3-3/4! Get 25% discount on Sale Styles with Promo Code: SPRING25. Valid 2/28 only! Two Day Sale: 30% discount on Sale Styles with Code: NAT2DAY (Valid 2/24-2/25)! 25% discount on Sale Styles Plus Free Shipping! Use Code GIVEME25 (Valid 2/14-2/19)! Save 15% discount on Sitewide with the Code NATGO15 at Checkout! 25% discount on Sitewide Plus Free Shipping with Code: NATSAVE25 (Valid 1/27-1/28)! Extra 25% discount on Sale Styles for Savings Up to 50% with Code EXTRA25OFF (Valid 1/17-1/21)! Get 50% discount on Boots with Code: BOOTS4ALL. Valid 12/11-1/3! Get 50% discount on Boots Plus 25% discount on everything Else Plus Free Shipping with Code CHEERS19. Valid 1/1 only! Get 50% discount on Boots Plus 25% discount on everything Else Plus Free Shipping with Code SHOP4U. Valid 12/26/18 Only! Get 50% discount on Boots Plus 10% discount on everything Else Plus Free Shipping with Code ALLISCALM. Valid 12/18-12/25! Get 50% discount on Boots Plus 25% discount on everything Else Plus Free Shipping with Code GIFTNOW. Valid 12/16-12/17! One Day Sale: Get 25% discount on Site wide Plus Free Shipping with Code: MONDAY25. Valid 12/10 only! Get 25% discount on Boots / 20% discount on Sneakers Plus Free Shipping with Code: SNEAKERS4U. Valid 12/6-12/9! Get 25% discount on Boots / 20% discount on Heels Plus Free Shipping with Code: HEELS4U. Valid 12/3-12/5! Get 25% discount on Boots / 20% discount on Flats Plus Free Shipping with Code: FLATS4U. Valid 11/29-12/2!